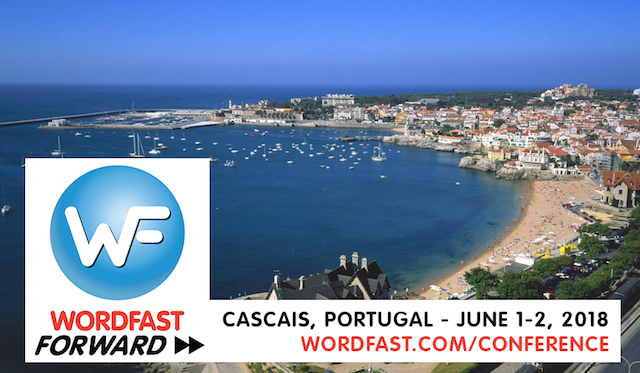 We are pleased to announce that the call for speakers is now open for the 4th annual Wordfast Forward User Conference to take place on June 1-2, 2018 in Cascais, Portugal. The conference program will feature two full-days of hands-on learning about Wordfast’s entire product suite, a pre-conference trainers symposium, software integration sessions, and one-to-one meetings with experts. The networking program will include a gala dinner and informal meet-up dinners, a surfing safari, a night out on the town, and more exciting events! Being a speaker is your chance to be a part of the official program and share your savoir-faire with colleagues. We are looking for sessions specifically related to how you use or manage the use of two tools from Wordfast and why. We are also interested in sessions that show how you use other tools in connection with Wordfast to run your translation business or as part of your translation workflow. Finally, we’d love to have a fun, interactive session (translation-related or not) that would be of interest to attendees’ guests and participants alike (like Marian’s chocolate tasting session in 2016!). If you have a proposal that is not related to the above, but you are convinced users will find your content constructive, by all means, please submit your proposal! Your submission must include the following: your bio, a brief description, and at least two learning objectives. Speakers will be entitled to a 50% discount on the conference fee, priority room booking at the Hotel Estoril Eden, and a few more surprise VIP perks. The deadline for submissions is January 26th! Speaker or not, we look forward to seeing you in Cascais. Stay tuned, registration will be opening soon! I do not think I will fly to Porugal. 1. EU language SW laboratory offers free tools (SW to download and to install). A short time TM server for maximum 10000 TUs has name Cyclosis. The pages are in English, French and Esperanto. Another method, instead of a) with WFP and b) I open PDF directly in MS Word 2016. It is faster, but DOCX is very big.